Wembley Stadium is, after Camp Nou, the second largest stadium in Europe and the standard playing venue of the English national team. 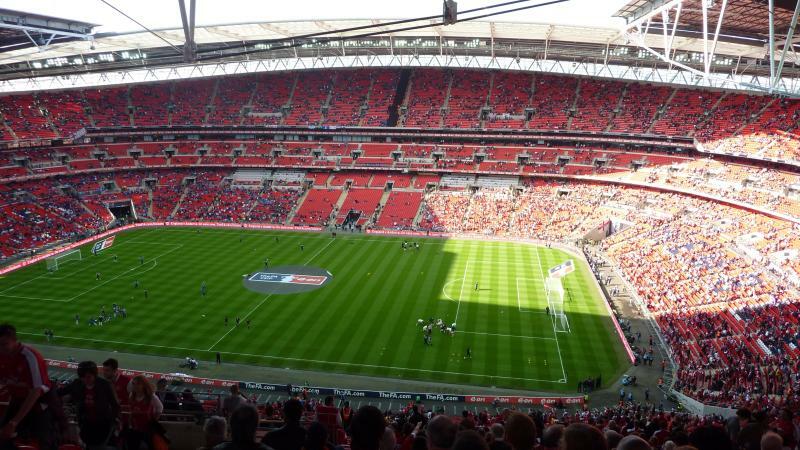 It also hosts the annual League Cup final, FA Cup final, and the Community Shield. Wembley Stadium replaced the old stadium with the same name that had stood in its place since 1923 and had been host to many cup finals. The old Wembley Stadium got demolished in 2003, after which construction of the new stadium started. After several delays, postponing the opening of the stadium for almost two years, the stadium finally got completed in 2007. Wembley Stadium officially opened on the 19th of May 2007 with the FA Cup final between Chelsea and Manchester United (1-0). Earlier other official football matches had already been played, of which a match between the English and Italian U21 sides was the proper first. The new stadium was designed by architecture firms Foster and Partners and Populous and is estimated to have cost a total of £757 million. Most iconic feature of the stadium is its 133 metre tall arch, that, with its span of 315 metres, is the longest single span roof structure in the world. 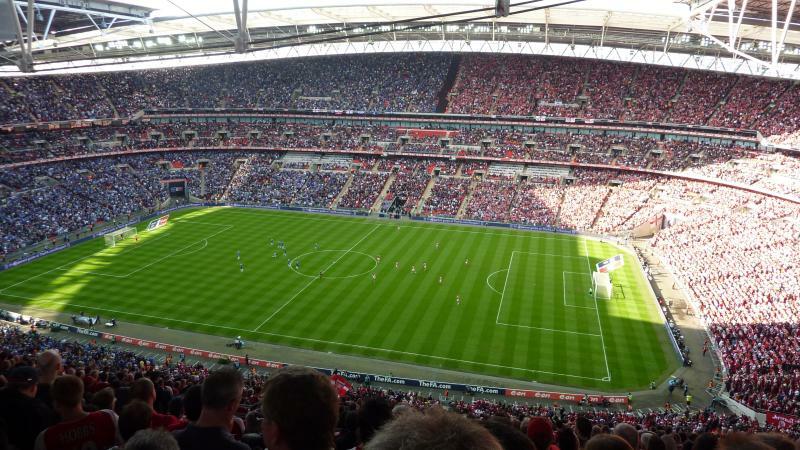 Wembley Stadium furthermore has a sliding roof that sits 52 metres above the pitch. 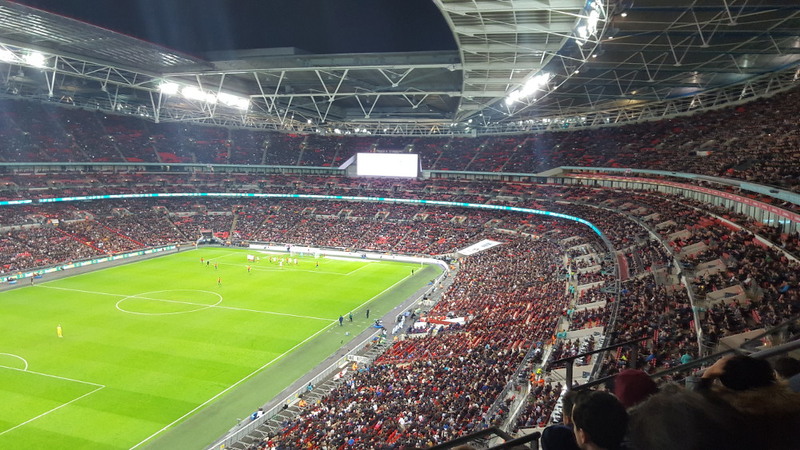 Even though the roof does not completely close, it does cover every seat in the stadium, which makes Wembley the largest fully covered stadium in the world. The stadium hosted the 2011 Champions League final between Barcelona and Manchester United (3-1), and two years later the 2013 Champions League final between Bayern Munich and Borussia Dortmund (2-1). Wembley Stadium is located in the north-west of the city of London, about 6 miles from Paddington station, 7 miles from Marylebone station, and 8 miles from Kings Cross St Pancras and Euston station. The stadium is best reached by underground. Wembley Park tube station, a 5-minute walk from the stadium, is served by the Jubilee and Metropolitan tube lines. Both lines connect the stadium with London’s city centre, though the Metropolitan line does so with fewer stops. 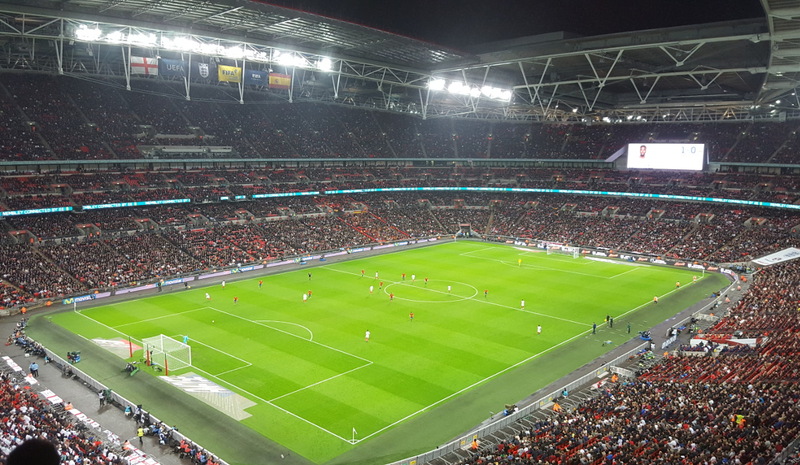 The stadium is also within walking distance (10 to 15 minutes) from Wembley Central metro station, which is served by the Bakerloo line and the London Overground metro. Alternatively, it is possible to reach the stadium by train from London Marylebone station. The journey to Wembley Stadium station takes about 8 minutes, but trains only run every half an hour. Finally, local buses 18, 83, 92, and 224 connect the stadium with local destinations as well as other parts of the city. It is advised not to arrive by car on matchdays, or only if parking is booked in advance. On non-matchdays the stadium can be reached by car from the A406, which connects with the M1 slightly further north. The exits toward the stadium are signposted from the A406. From central London the stadium can be reached by driving up Harrow Road (A404) in north-western direction. Harrow Road branches off the A40 at the altitude of Paddington station. At Wembley Rail Station turn right onto Wembley Hill Road to reach the stadium (follow the signs). 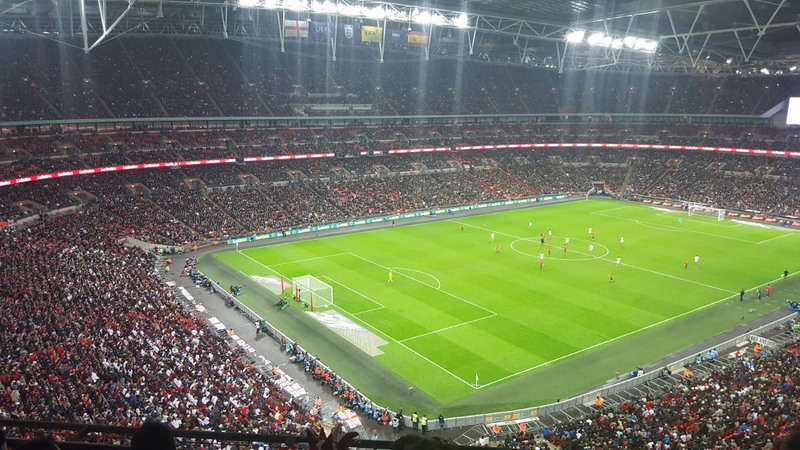 Wembley Stadium is located in a quiet residential area with some offices mixed in. The few pubs and eating options, for example near Wembley Park tube station, tend to get very crowded on matchdays, and it may be a better idea to eat and drink in central London. There are a few hotels near the stadium for those that like to avoid a crowded tube ride. Most of the hotels are of the typical chain hotels such as a Premier Inn, Ibis, Holiday Inn, and Hilton. They come in different price ranges. 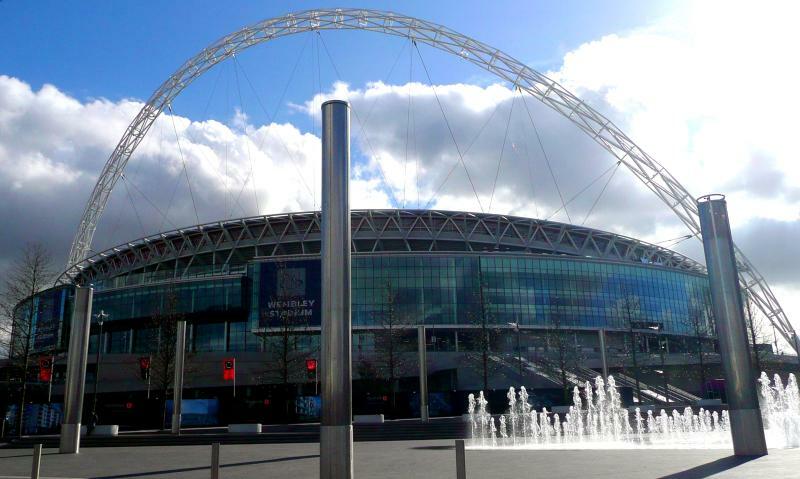 For all hotels near Wembley Stadium click here. If you choose a hotel in central London, you can try to strategically pick a hotel close to the Metropolitan or Jubilee line to ease the journey. For example, there are many affordable options near Paddington Station, which is not far from tube stop Baker Street. For all hotels in central London go here. If you arrive by car, you can also choose a hotel further up one of the two metro lines so that you avoid the crowd that comes from central London. It will be easier to park as well. Ticket sales for the English national team go through the FA. Tickets can be bought online, or by phone +44 (0) 844 847 2010. Tickets for FA Cup and other finals can only be bought through the clubs involved. If you’re looking for Wembley concert tickets, or tickets for events like the NFL International series or the odd boxing match, Ticketmaster tends to be the official primary seller. Wembley Stadium offers guided behind-the-scenes stadium tours that include the changing rooms, press room, players’ tunnel, and royal box. The tours last about 75 minutes. Tours run every day of the week between 10:00 am and 4:00 pm, at least every hour, but often twice an hour. Tours do not run on days of major events or a number of public holidays. Walk-ups are allowed but subject to availability. Tickets can be booked online, or by calling +44 (0) 844 800 2755. The tour costs £15.00. 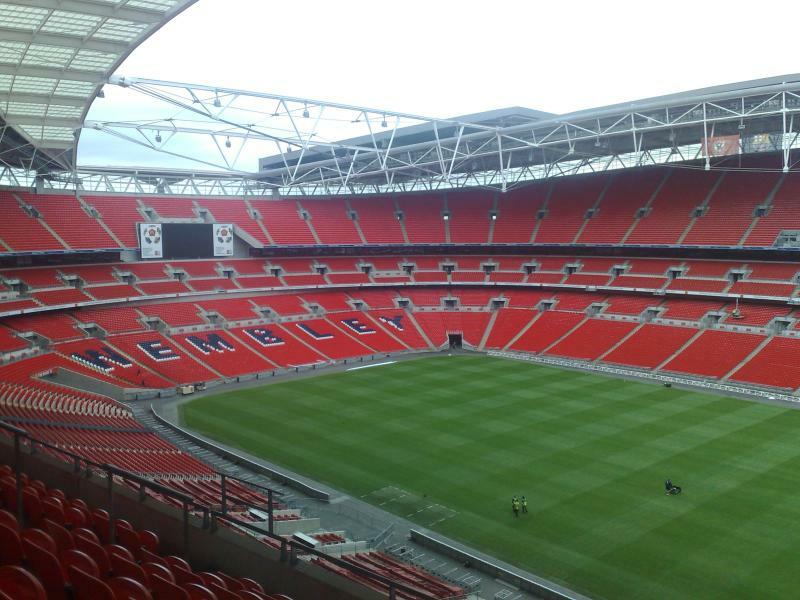 For more information email tours@wembleystadium.com. Wembleystadium.com – Official website of Wembley Stadium. Journeyplanner.org – London area public transport journey planner. The current home of Tottenham Hotspur, and the most luxurious and expensive stadia in England. This stadium has held the UEFA Champions League final a record eight times (in the past, and present). Wembley sits where the old stadium once stood, and The FA have offices within the stadium. I’ve watch St. Helens play there in many a final. A great venue with great atmosphere. I have been to Wembley twice so far. Absolutely amazing. Everything about the place is great. The only problem i had on both ocassions, was a long queue after the games. Very easy to reach by tube. It is a must-see by every football fan. The home of football. the most greatest stadium in the world and it should make the brits proud as they invented the beautiful game.